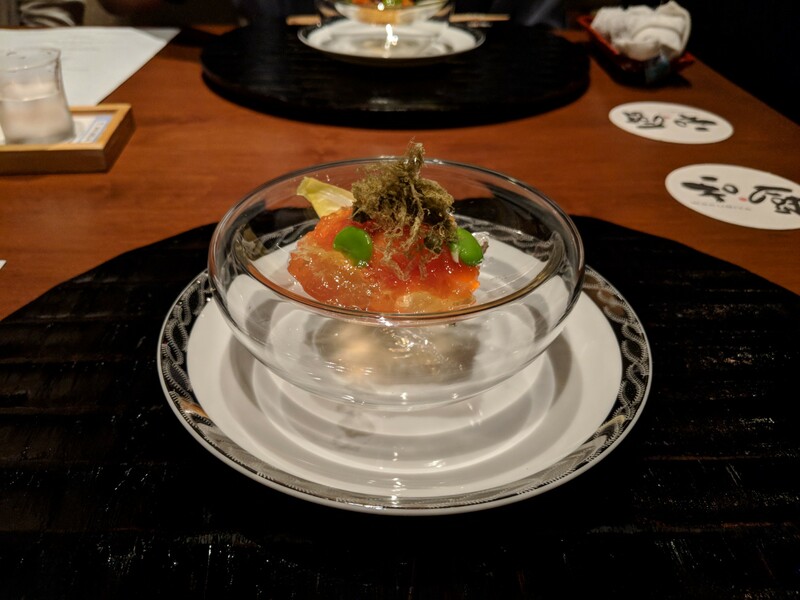 If you’re looking for a really special dinner with awesome service with the best Japanese food along & exclusivity, look no further than San Mateo’s Wakuriya. 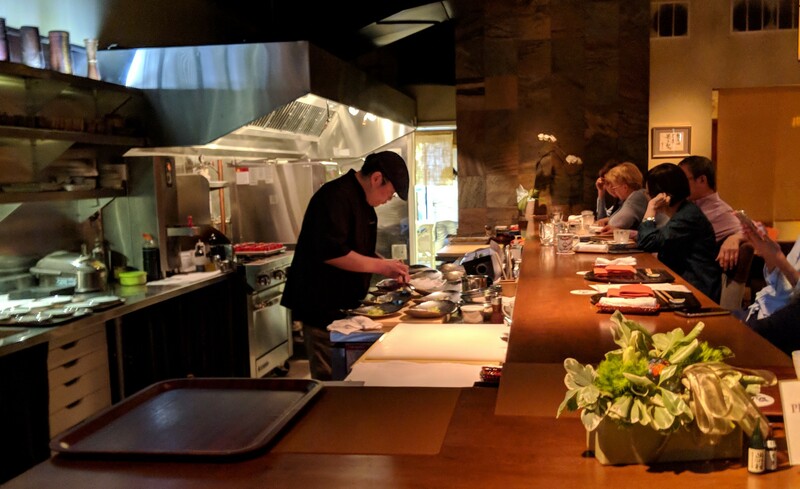 It’s a Japanese multi-course kaiseki restaurant utilizing quality ingredients flown in from all over the world, with a space that only fits five tables along with bar seating. To top it off, it’s a Michelin-rated restaurant. You can’t book a table online. They’ll only take phone reservations, but with a catch. When you call the restaurant, you have to request the day exactly 30 days from the date you call. If I called on the midnight of June 23rd, I have to specifically ask for a table for July 23rd. But they’re also closed on Mondays & Tuesdays, so check your calendar to make sure you’re not requesting on a closed day. That’s if your call can get through. In most cases, you get a busy tone when dialing. The first time I booked this restaurant, it took me about four consecutive nights for my call to properly connect. If successful, your phone will reach their answering machine. You leave your name, number, how many people in your party, & the exact date of your future reservation. Getting that date wrong will invalidate your request. It took me a few connected calls to learn that lesson. Worth noting that this restaurant isn’t big, so it would be tough to accommodate a party of 10. Tables seat four people at most; best to keep your party small. If successful, the restaurant will call you back later during the day to inquire about your reservation. She’ll let you know that she’ll write your details down in her calendar, but your reservation isn’t officially booked. About a week before your reservation date, she’ll call you back to confirm again. If you confirm then, your reservation is officially locked down. Phew. 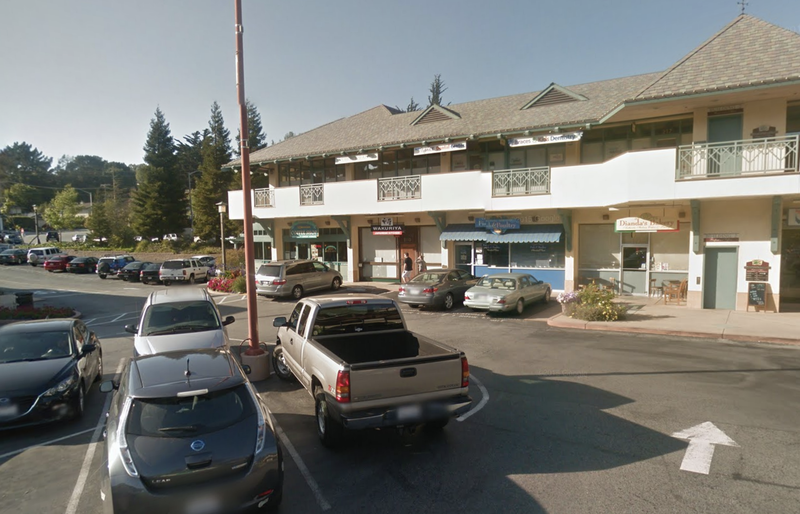 This restaurant has an unassuming facade in a random strip mall in a small corner of San Mateo near the intersection of Highway 92 & Interstate 280. 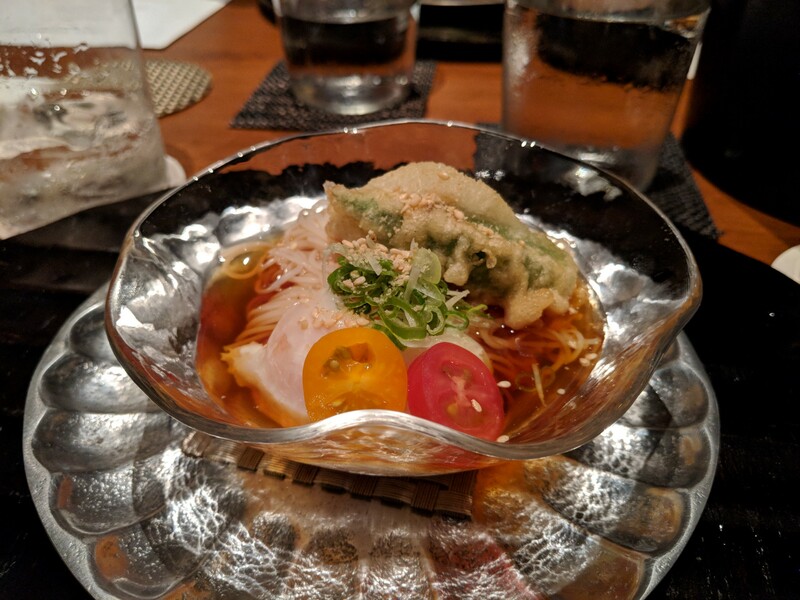 The staff is super nice & the decor is Japanese modern with unparalleled attention to detail. Even things like their flatware has nice touches. 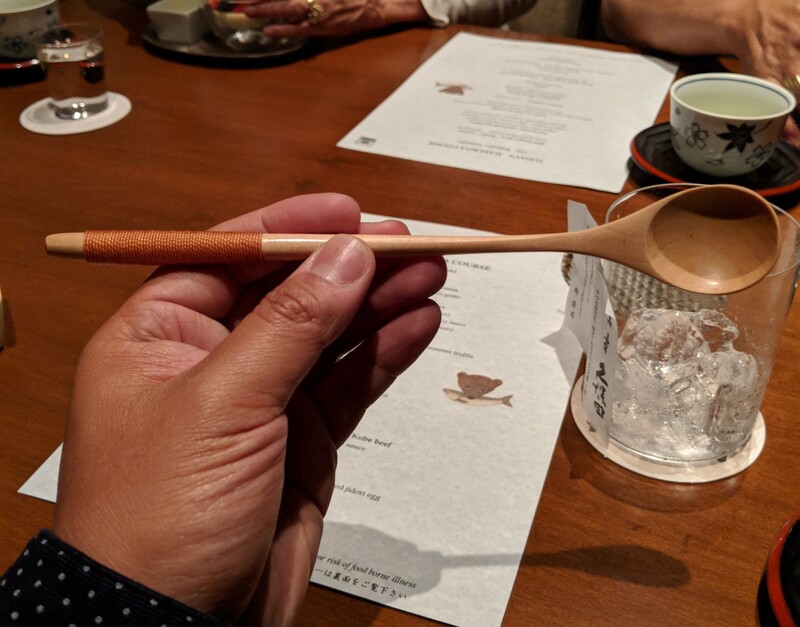 Check out the thread-wound handle on this wooden spoon! It’s by no means pretentious & you can probably dine there dressed casually, but all the clientele aimed for business casual, so do the same & you’ll be fine. Set aside about two hours for dinner; they’ll pace your courses slowly. Now the reason you’re probably reading this post — let’s get to the food! First course: salmon served with fava beans over this dashi jelly. 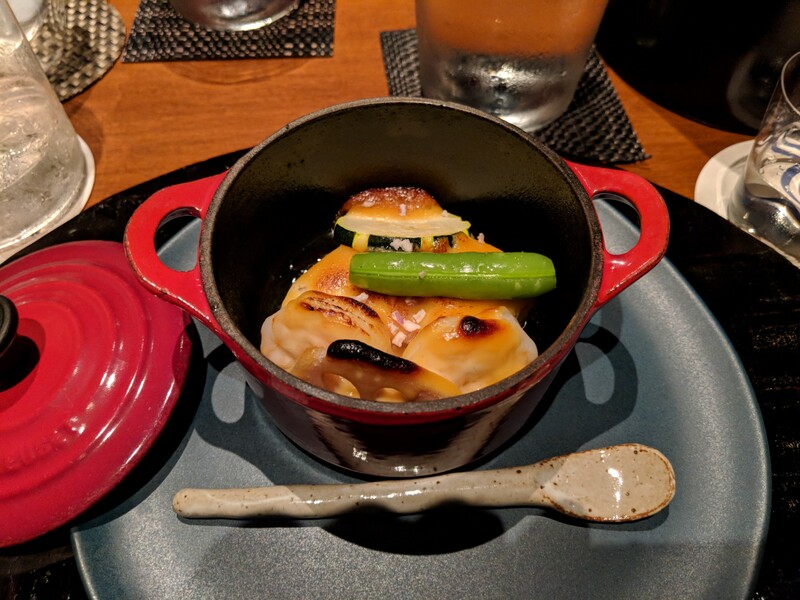 Dashi is great in miso soup, but I’ve never had it as a jelly. 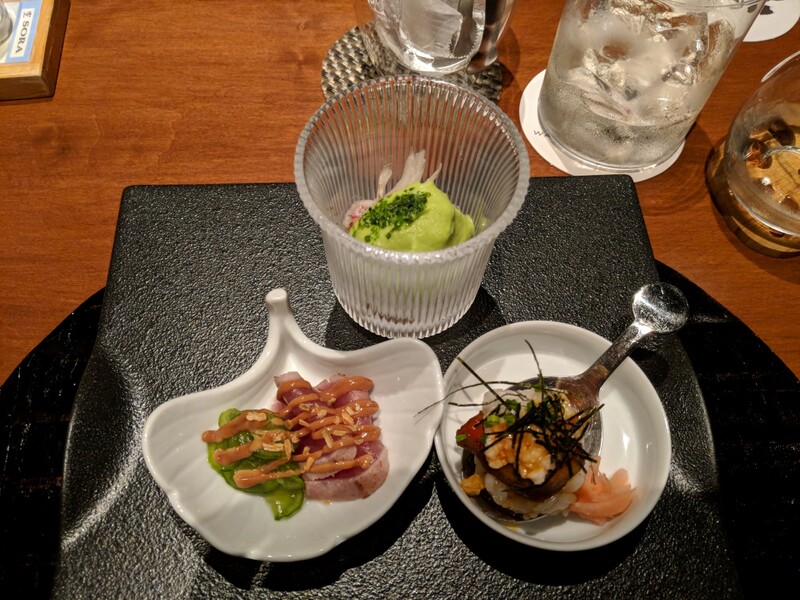 Second course: lobster with a sweet pepper, tuna with a cashew soy sauce, & a single bite of sushi with a mountain yam & foie gras! I’m usually leery about foie gras because it’s generally a very rich flavor, but the amount used was a good balance with the fish. Third course: a chawan mushi with duck & mushrooms, with thin slices of summer truffles! The dashi makes another appearance here which gave everything a good miso vibe. Fourth course: various sashimi with a drizzle. Drizzled in slow motion for dramatic effect. Fifth course: a gratin with Alaskan black cod, lotus roots, zucchini, & shrimp. Gratin usually is made with cheese, but I was willing to take the plunge despite my cheese aversion. Thankfully it was more on the buttery side, tasted great! Seventh course: US wagyu in a miso & tomato sauce. 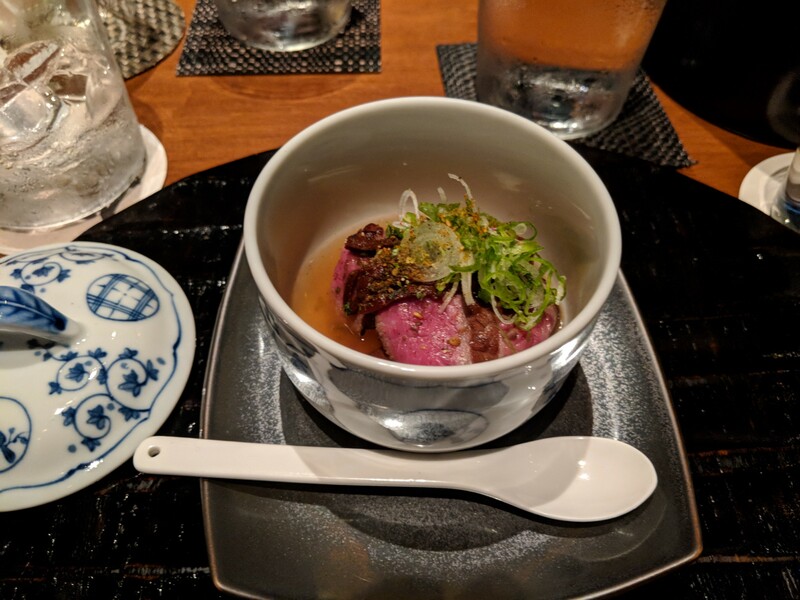 This was the first time I’ve had wagyu in a sauce. It was yummy, but I usually enjoy my steaks in its pure form without any overpowering sauces, or in a soup in this case. Eighth course: cold somen noodles, with deep fried okra stuffed with a scallop & a jidori egg. The egg was this deep orange color & served like it was over medium, not exactly hard but had its softness. The winner was the okra. Usually bitter, the scallop & the tempura helped cut down the bitterness of the okra. 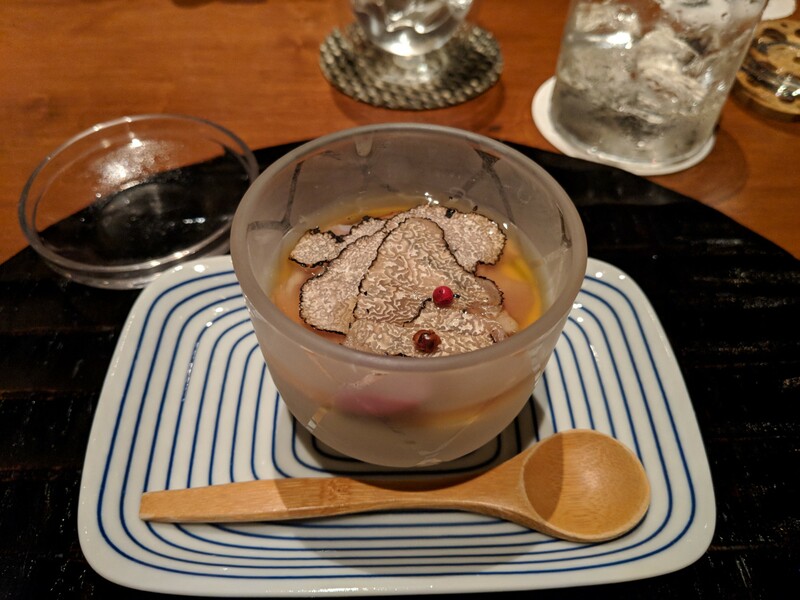 Ninth & final course: a parfait with a custard you pour on top. It all comes at a good value. Initial sticker shock — about $100 per person—but considering you’re getting nearly a ten course meal, I’d say that’s the best money can buy.